Tonight there is hype around Manchester Arena for the overdue return of Thirty Seconds To Mars, who surfaced earlier this year with their new album Love, Lust, Faith + Dreams which stormed the UK rock charts to the number 1 spot. But before the Thirty Seconds To Mars hit the stage, You Me At Six have the challenge of warming up the crowd, for what is set to be an incredible show. Back in 2009 You Me At Six took the stage here at Manchester Arena supporting Paramore, having just released their second full-length album Hold Me Down. Looking slightly fragile they found it a little difficult to fill such an intimidatingly large stage in front of 16,000 people. Four years on and You Me At Six take the stage looking fresh, confident, and better than ever. As the room slowly starts to fill the Surry quintet burst onto the stage to the slick opening riff of Reckless, as front man Josh Franceschi glides his way confidently around the stage fist pumping and kicking, before encouraging an enthusiastic crowd to get up off their feet. The band fly through their set built up heavily from the 2011 top 10 album Sinners Never Sleep, and the crowd starts to liven up as the atmosphere builds through the sensational Loverboy and little death. Franceschi later takes a moment to challenge the crowd to light up the arena with their phones and lighters before slowing down the set with the intimate ballad Crash, producing one of the highlights of the night. It’s clear that You Me At Six now have no problem taking on a tough crowd, which is something most support bands struggle with when faced with 16,000 inpatient fans. The pace picks up for the new single Lived a Lie, which mixes an infective bouncy pop chorus with slick guitar work to give the crowd a hint of what is to come from next year’s album Cavalier Youth. As a short set comes to end, the front man calls for crowd surfers and mosh pits as the band finish off a bold set with the blistering Bite My Tongue and Underdog, before teasing the crowd with news of a UK tour to come in April. If tonight is anything to go by it won’t be long before You Me At Six are back headlining arena shows themselves. However tonight’s show is all about Thirty Seconds to Mars, who are no strangers to filling out arenas for an incredible performance. 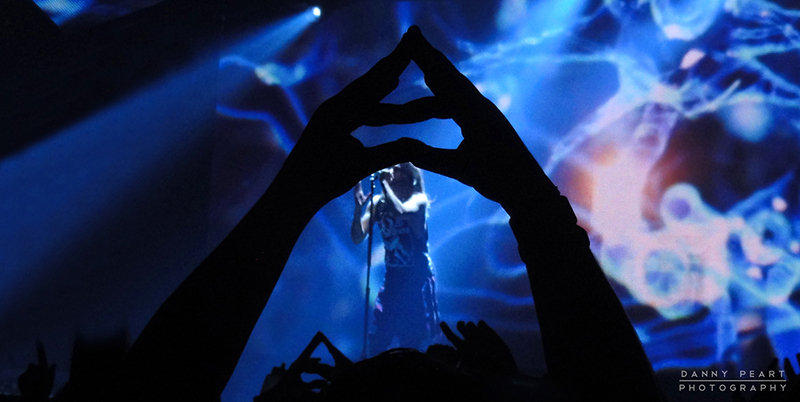 After a 50 minute wait the lights drop and the drums begin to pound out the intro to Birth, and the curtain presenting the bands triangle logo drops to display lead singer Jared Letto peering over a structure containing his band members. Letto standing tall shines torchlight around the crowd to deafening screams, before the Californian rockers jolt into Night of the Hunter to get the show started. The energetic and powerful Conquistador kicks off a treat with gigantic colourful balloons and a storm of confetti floating around the crowd leaving everyone breathless. As the show progresses Letto leaps across the stage waving the England flag around as he declares his love to the UK, before a slightly flat performance of the new single City Of Angels. Tonight’s set list is built up of a crowd-pleasing mix of songs from this years release Love, Lust, Faith + Dreams and 2009’s This is War, but noticeably continues with the absence of the epic A beautiful lie, From Yesterday, and Attack from the bands 2005 album A Beautiful Lie. Nonetheless tonight is not just about the music, as Thirty Seconds to Mars put on a show based on the theme of their video for Up In The Air; with acrobats spinning around the stage in hoops, and flying off a seesaw breaking out shapes as they soar through the air. The hair-raising flow of the set suddenly halts as the band take a break mid set while Jared Letto serenades the crowd with a small number of acoustic requests screamed his way. Two fans get pulled onstage to join him for a stripped back version of The Kill, which feels slightly lifeless for such an electrifying song. However the pace soon picks back up for Closer To The Edge with a call for people to get up on their friends shoulders as another explosion of white confetti falls from the arena roof like snow. The Encore featured a cover of Rihanna’s Stay, before ending the night with a group of fans invading the stage for the sensational single Up In The Air to close of the night in style. It’s safe to say that what Thirty Seconds To Mars lack in quality of sound tonight, they certainly make up for with an incredible show.